I was approached by Mark Cochran, architect, interior designer and owner of Cevian Design Lab in Downtown Rome, GA, about collaborating on a few pieces for his newly renovated office space on Broad Street. 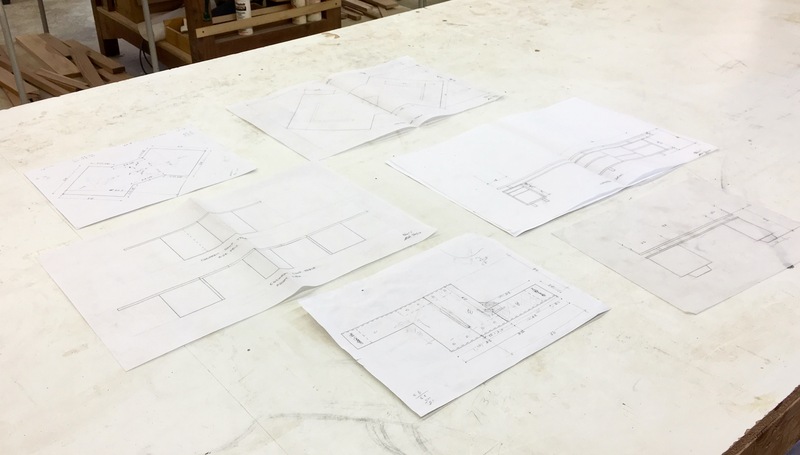 With a passion for design, Mark knew he was looking for a Mid-Century Modern motif as he drew out the desired shapes and sizes of the tabletops for a conference table and desk. Construction drawings in the Southern Joinery workshop. The physical size of the pieces offered several new challenges to the techniques that I use in my shop.The conference table was 7′ x 12’4″ and the desk was 4’2″ x 14’3″; both pieces had to be constructed as two separate structures that would be abutted during the final assembly in the upstairs studio. During our consultation, black walnut was selected as the material of choice due to its beautiful natural color and grain. Since I built the table as two halves, the separate bases of the table consists of a large and small right angle pedestal. The smaller pedestals join at the center of the piece. 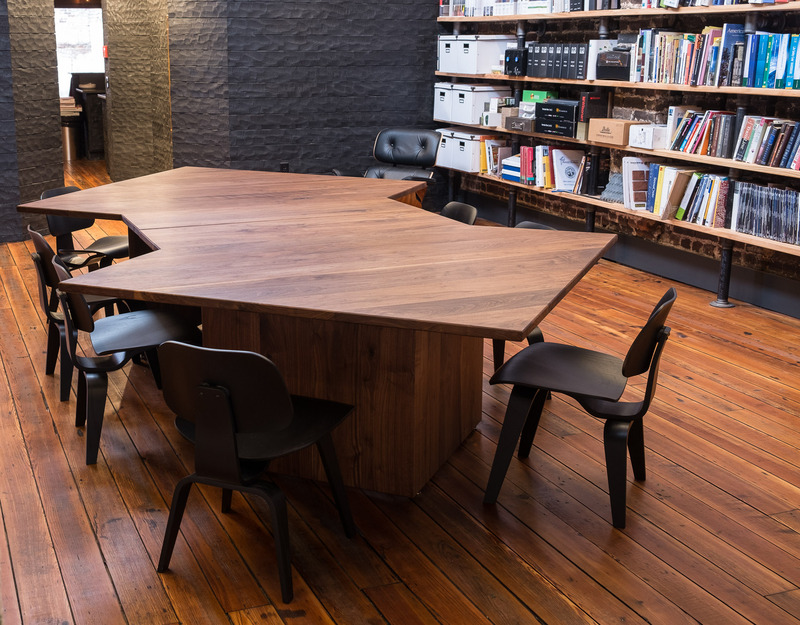 The conference table will easily seat ten people and is used daily by Mark and his team for a variety of uses. 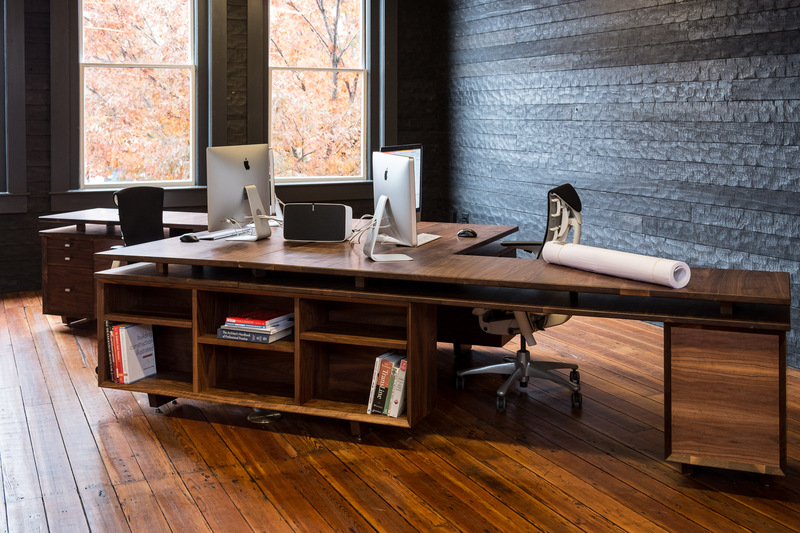 The desk was constructed as eight different pieces all built separately and assembled in the office. The base for the desk consists of two bookcases and two file cabinets. The tabletop is two desktops and two intermediate tops. It is designed as two different workstations for Mark and his associate. The resulting pieces add a distinctive and unique element to his Modern office. I had the opportunity to work with a highly renowned architect, and it was my privilege to bring his sketches to tangible, functional works of art. This was the most unusual, fun, and challenging project of my career!